“The Home of Golf” at St Andrews is the only venue in Britain that can lay claim to having seven courses in its portfolio and the Jubilee, the third oldest course at St Andrews, is perhaps the most underrated of them all. In March 1897, John Angus was presented with the challenge of designing a course suitable for beginners and having it ready for play the same year. The 22nd June 1897 was a public holiday to celebrate the Diamond Jubilee of Queen Victoria and on this day a rudimentary 12-hole course was ready for play. In commemoration, it was called the Jubilee. At the turn of the century, the course was extended to 18 holes, and in 1946, Willie Auchterlonie made further improvements to the layout. In 1988, Donald Steel gave the Jubilee a complete overhaul and upgraded the links to championship standard. The course now measures over 6,800 yards. The Jubilee plays on a narrow strip of links land, wedged between the New course and St Andrews Bay. Some of the holes thread their way through low sand dunes. It’s a much more “normal” layout than the Old and the New. The Jubilee has no double greens or shared fairways, but it does play in the same out-and-back fashion. The Jubilee’s raised tees provide unparalleled views across St Andrews Bay to the east and the fluttering flags on the other St Andrews courses to the west. It would be fair to say that the Jubilee was an ordinary course before Donald Steel got his hands on it, but it’s now full of variety and character with a very strong collection of par threes. So it’s no surprise that since Steel’s changes, the Jubilee has already played host to a number of important amateur championships. The Jubilee was the 3rd course at St. Andrews. Originally, it was a 12-hole course for lady golfers and opened in 1897, commemorating the Diamond Jubilee of Queen Victoria. The course was extended to 18 holes in 1905 by a St Andrews resident, Willie Auchterlonie, who was also a former Open champion. He also did the 1946 redesign to over 600o yards. The last redesign was completed in 1989 and extended the course to over 6700 yards, adding new holes and elevating tee boxes. The locals consider it the toughest course in St. Andrews. The first hole welcomes you, it is not very long. Best approach is to come in from the right, as the green does not hold well and there is a bunker short left and long right. The 2nd is similar to the first, not long and the best approach from my perspective is from the left. The green is long and narrow with bunkers short right and left and has a severe slope off the greens right side. The 3rd is the first par 5, tough to get to in 2 as there are 3 bunkers guarding the left and right side at anywhere from 250-300 yards out from the tee box. Be satisfied with your preferred approach yardage. The fifth is the first par 3 and has a large green with two different challenges. If it is front right be wary of the two bunkers, if it is back left, it is at least another club and if you miss the green you will probably be gorsed. The second par 5 is the 6th hole. Long hitters have a better chance of reaching this one in two, however danger lurks, with five bunkers protecting the green. For us mere mortals favor the right side off the tee and on your second shot to give yourself the best chance at birdie. The par 4 8th is my favorite. It is a slight dogleg left and parallels the Eden Estuary. The green has banking on 3 sides, which can save an errant approach shot. I hit one of my best drives of the day and was just over 50 yards out, right of center to a front pin with a skinny lie. I am contemplating options and I said to one of my playing partners, Vince, “I am thinking of putting it.” Vince said that is what he would do. I gave it a whack and did not think I hit it hard enough. I am cheering my ball to go, go. Finally, it got to the green and I saw the errors of my ways and now I am begging, whoa, whoa. It finally came to rest at the back of the green. As a sign of the apocalypse I miraculously made the putt for a bird. I paced it off at 47 feet. I don’t think I have ever had two putts that totaled over 200 feet on a hole! The 9th is a 190 yard par 3. Bunkers right and one short left. However, aim well left as just about everything will go right hard. The 11th is a reachable par 5, slight dogleg left, for long hitters. Coming in from the left is most effective, but be forewarned about the OB on the left side. Twelve is also a par 5 and also a dogleg left. I strongly advise against hooking your approach into the greenside bunkers left, *&*^(%$! The par 3 13th plays a little shorter than you think from the elevated tee. Also, be wary, there is a second bunker right that may be difficult to see from the tee box. The 14th is a long tough par 4. You will find it easier to get to the green from the lefthand side. The 15th is not a long par 4 but it is blind. Left or right is NG off the tee. The green is hidden behind a dune. The green has a massive false front. Above the hole is death. The 16th also has a blind tee shot. Do not feed your ego and try to cut the corner. Aim center or right. This greens slope left to right, make sure your approach is left of the pin. The 17th is the longest of the par 3s and is guarded by 4 bunkers, two on each side. There is a lovely view heading back into town. The 18th is a long demanding par 4. It has a well- protected green with five bunkers. Jubilee is a tough course. It is a classic 9 out 9 back and is text book for low running shots. It is a perfect appetizer for The Old Course. I would not pay to play it again. The rating doesn't appear to support the words. For me the Jubilee is better than most courses in the area including both Crails and Elie. Get the St Andrews 3 day ticket and play 54 holes a day. Great value and a fine course. The Jubilee course carries on in much the same vein as the New. It is slightly longer at 6,742 yards but has a par of 72 so in reality plays about the same length. Some say it is the toughest of all the courses but I would put it on a par with the New is this respect. The most easterly located of all the courses it perhaps enjoys the best of the terrain and is closest to the sea. It is slightly more undulating and even some dunes come into play on a few holes. The set of short holes perhaps isn’t as strong on the Jubilee as the New but there isn’t a dud amongst them. And those who enjoy golf in the dunes will savour some of the holes that play through modest sandhills which are used to best effect at the terrific 15th. There are certainly some magnificent moments on the Jubilee but it isn’t quite as consistent and as subtle as the New. However, should the first tee be quiet on either of these two courses you would be quite happy to flip a coin as to which you play. For me the Jubilee is far harder than the New. I think that it’s the hardest of the St Andrews courses and by some margin. The closing stretch from 14-18 is brutal. Played the Jubilee on the 1st day as part of the 3 round winter package. What a fantastic golf course. The front 9 is fairly short but extremely tight in places with a couple of fantastically laid out holes. The 2nd stands out, a narrow landing area between the dunes leaves a short iron to a huge sloping green from back to front. Run off area on the right feeds the ball down into the pot bunker and tree that sits at the bottom of the valley. This hole typifies everything about the jubilee course, very risk reward but the key is to keep the ball in play off the tee which in places means taking irons off the tee. The back 9 is a lot tougher, 2 back to back Par 5's are followed by a clever little par 3 framed by the gorse then a string of extremely tough Par 4's. The signature hole 15th is a fantastic Par 4. You tee off to an elevated fairway that sits inbetween the towering dunes. 2 pot bunkers lie at the left corner of the fairway to make the tee shot extremely tight. The 2nd shot is played thru the valley to an elavated green perched at the top of the huge sand hills. It is a brilliant Par 4 that requires 2 well struck shots to hit the green. Overall the condition of the course was fantastic for February, greens were running very good, not as fast/true as them on the Old Course but still impressive for the time of the year. Would recommend to anyone if they go up to St Andrews, it's a fun/challenging course that accompanies the Old fantastically. There may be fifty shades of grey but on Valentine's Day in St Andrews there was only one - the East Coast of Scotland variety. Still, I thought maybe the stiff wind would whip my game into shape and anyway here I was at the Home of Golf in February and it was possible to play (sometimes you can't even stand up here at this time of the year) and complete my set of the four traditional St Andrews links. A wise man - Jim McCann by name - says it is hard to believe the Jubilee and the Old Course occupy the piece of land and having thoroughly enjoyed my round I see exactly what he means. The Jubilee has narrow fairways, small greens, dunes and proper rough, Even a solitary - and wonderful - tree at the second! There is great fun to be had on the Jubilee with the changes in elevation, the dog-legs and the proximity to the estuary at the far end of the course. And this is a proper test of golf - several locals said to me they consider it the hardest of all four courses. Obviously, any visitor to St Andrews will want to play the Old Course but should they miss out in the ballot I can strongly recommend they move a few hundred yards and tee it up on the Jubilee. Being closest to the sea and fully exposed to the elements, the weather makes a bigger impact on your round on the Jubilee course than its two neighbours at St. Andrews. For a short course, it is still a stern test. On a relatively calmer day, it is possible to score well, but if the wind is blowing, the narrow fairways become even smaller targets. Despite that, it is a great track to play for all skill levels and goes to show that good design provides as good a defense as length in the modern game. On your next trip to the home of golf, take time out to play this little gem. The views alone are worth it. My view is that the Jubilee is now the most picturesque and most fun to play of the major courses administered by the Links Trust. Visually, the Jubilee has the benefit of being the closest to the lovely stretch of beach along the West Sands and being the only course to play amongst some sizeable sized dunes. These dunes are in play, especially around the 2nd green and 15th hole. The need for accuracy is in constant demand. The 8th hole runs alongside the Eden estuary and is a real birdie opportunity being a par four of 369 yards. Whilst the green is sunken and sheltered, many airborne second shots disappear into long grass or out of bounds on the left. The 9th is located at the far corner where the Eden Estuary meets the sea and is always exposed to the breeze. This can be a tough par three hitting from an elevated tee to a crowned green. If it is windy then watch your shot on the 10th because out of bounds is all the way along the left hand side. The 15th is a strange but interesting hole at only 356 yards in length. A well hit drive should leave you with just a short approach and you are entitled to wonder how this hole can be rated the fourth most difficult. All is revealed when you play your shot into the green. Just short is a very deep gully and any ball landing here is pushed left or right. Almost an out and back design closest to the coast and more exposed. Main features are a solid quartet of par threes and a tough finish. A good course to walk. Some tough pars 4s coming back into the wind. The New has more variety of golf, the Eden is more fun with more interesting greens, the Jubilee improves with each round. The nicest surprise of a visit to St Andrews, don't miss. Played April 25, 2014. First UK/links course ever played and it was very enjoyable, despite a pretty thick fog on the front nine and then a steady rain and strong wind on the back nine. Course was in very good condition. Greens were in very good condition, albeit considerably slower than what I am used to in the USA -- that meant lots of three puts for me, unfortunately. For the mid-handicapper, such as myself, a fun course that was not easy, by any means, but was not unfair -- extra strokes were of my own making. The views, even in the fog and rain, were very good! With Jim and yourself at the controls, Scotland is in great hands. It’s our correspondents and contributors that make the Top 100 website what it is. I read every review posted on the site and I thoroughly enjoy your comments. Thank you MPPJ for your continued contribution… it’s genuinely appreciated. We’ll work with you during 2012 to get tee times at the two remaining venues required to complete your personal Scottish Top 100. It will be great to have two people on the Top 100 team that have played them all. Beware though. We are about to publish our new Tartan Ton which will bring in new, previously unranked Scottish courses. Watch this space! Happy New Year. The Jubilee course completed my golfing year in fine style when our 4-ball took advantage of a wee weather window today to tee it up here. I thought the only disappointing hole on the outward half was the rather bland par three 5th, though the short winter tee position to the left of the fairway did nothing for a run of the mill short hole. That said, similar offset tee positions to many of the other fairways added great interest to those holes (Western Gailes is like this in the winter too). The elevated tee position on the 8th, overlooking the Eden estuary is a glorious vantage point to look back down the course and it precedes a more open section between the par threes at holes 9 and 13. 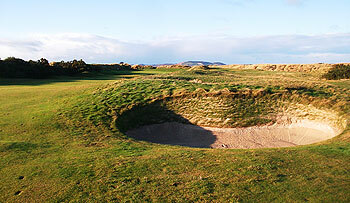 I just love the way that holes 1 to 6 and 14 to 18 alternate in a figure of eight on either side of a sizeable dune ridge that houses one of the best holes in Scottish golf; the wonderful 15th (“Steel’s Gem”), with its ultra-narrow entrance, dunes to the right, drop off into gorse on the left and a huge swale in front of a raised green. By all means play the Old course, and don’t discount the charms of the somewhat taken for granted New course, but you’re really missing out if you haven’t yet played the Jubilee.